So while I sit here with my cup of coffee in hand I realize that I am bound and determined to keep this going, each and everyday. I might not post every.single.thing I consume but I will do my best and try to incorporate more of my thoughts and feelings in my healthy life style. I get a ton of inspiration from all of you bloggers out there; whether that be about fitness, eating or living a greener lifestyle. We all have our own personality and add a variety of uniqueness to the blogger sphere. I know that I have just started my journey but I wish I had the readers and followers as some of the health bloggers out there. Hopefully it will come and I can help individuals live a better lifestyle. Oh, and look at my new mug! I found it at Statbucks the other day. 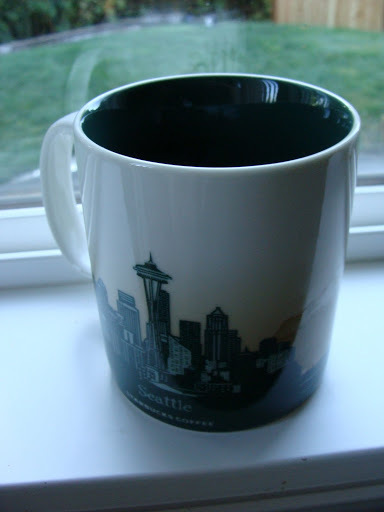 I (heart) Seattle, obviously, and I just had to buy it. 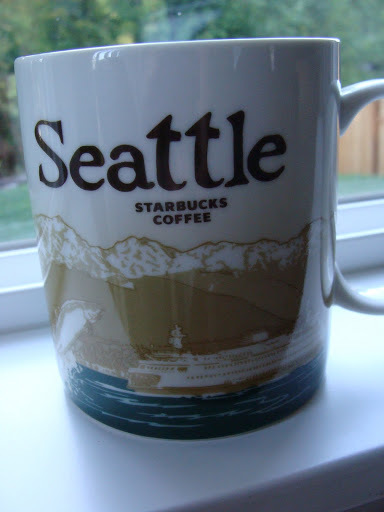 I love it because not only does it have the Seattle skyline on one side but it has the ferry system and a jumping salmon, too. Along with the Olympic mountains in the background. The PNW really is a beautiful place to live!